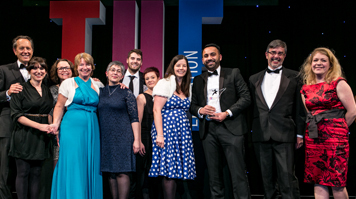 The Times Higher Education Awards are widely regarded as the Oscars of the higher education sector, shining a spotlight on the outstanding achievements of institutions, teams and individuals working in higher education across the UK. In 2014/15 LSBU supported 600 local SMEs, boosting growth and creating jobs. Enterprise activities offered by the Student Enterprise team have engaged over 10,000 students and staff, and supported 220 student and graduate business ideas this year. LSBU’s victory was witnessed by more than 1,200 people who gathered at the Grosvenor House Hotel, Park Lane. Commenting on the win, Professor David Phoenix, LSBU’s Vice Chancellor, said: “This is a fantastic accolade for the University and I am incredibly proud of what our staff and students have achieved. A full list of winners is available on the Times Higher Education Awards website.